Sony's new S750 Walkman comes with digital noise-cancelling | What Hi-Fi? The S750 boasts a 7.2mm chassis, 2in screen and a metallic, aluminium finish. Sony claims around 50-hours of battery life for music and around 10 hours when watching video. 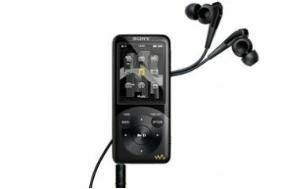 A set of EX earphones come with the Walkman and are joined by Sony's digital noise-cancelling technology, which claims to cut around 98% of ambient noise. A full complement of Sony's clear audio sound processors are on board, with clear bass, clear stereo and DSEE all aiming to boost performance from your digital files. Music can be dragged and dropped from Windows Explorer or iTunes, though it won't of course take DRM-protected files from the latter. The 2in LCD screen will show your videos – provided you convert formats such as DivX and AVCHD – and there's a first look at Sony's TruBlack technology that aims to reduce screen reflection. The 16GB NWZ-S755 and 8GB NWZ-S754 will join the A, W, E and B Series in the Walkman range, and will be on sale from October.